$17.50. 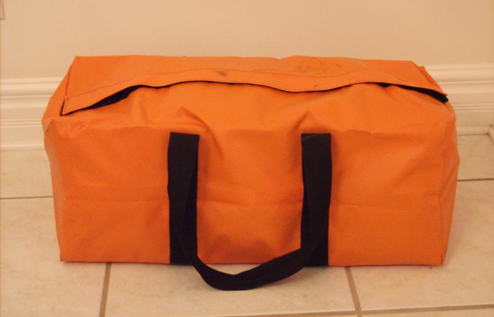 EASILY ACCESSIBLE, USED AS A RADIO BAG, GYM BAG, AND WITH REINFORCEMENT, A TOOL BAG. HUNTERS LIKE THIS SIZE. THE ADJUSTABLE STRAP WORKS WELL WITH THIS BAG. 8" x 8" x 15". $15.00. 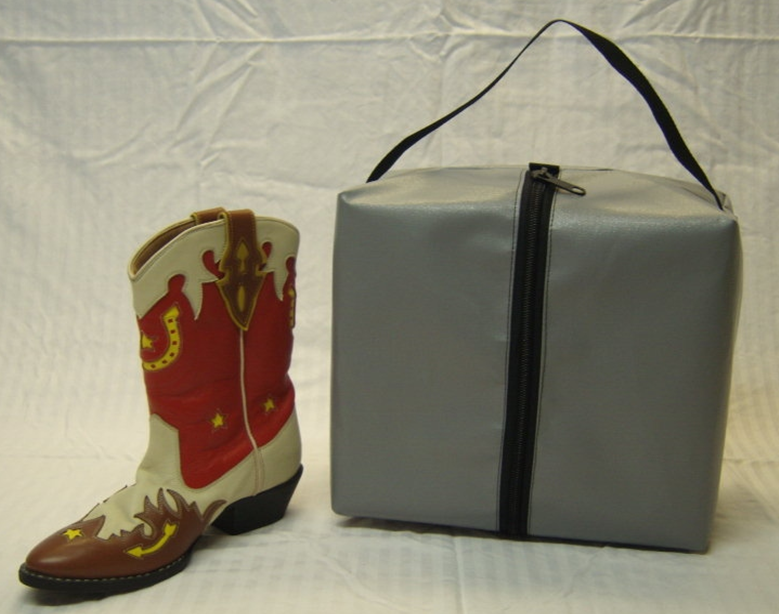 THE BOOT BAG IS A SPECIALTY BAG THAT WE ADDED TO OUR STANDARD BAGS BECAUSE OF ITS POPULARITY. 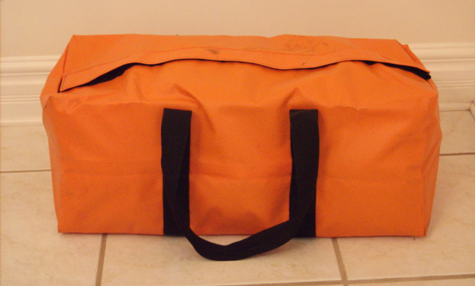 IT ROUGHLY FITS INTO THE END COMPARTMENT OF THE LARGE BAG. IT WAS DESIGNED TO SEPARATE DIRTY WORK BOOTS FROM OTHER GEAR. 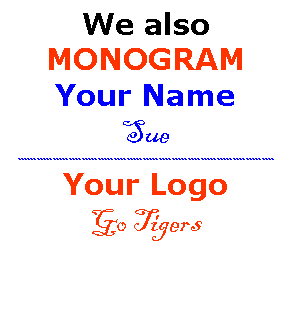 IT WILL HOLD UP TO A SIZE 12 BOOT. 11.5" x 12.5" x 9". MEDIUM WITH FLAP AND VELCRO..........$45.00 IDEAL FOR SUMMER, IT HAS AN "H" SHAPED DIVIDER THAT MAKES FOUR COMPARTMENTS INSIDE THE BAG. IT IS EASY TO HANDLE AND IS HANDY FOR CAMPERS AS WELL AS FOR THE OFF SHORE INDUSTRY. 12" x 29" x 10". 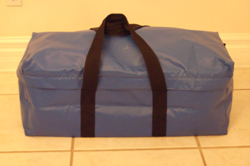 MEDIUM WITH A FLIP TOP..........................$50.00 THIS IS FAST BECOMING ONE OF OUR BEST SELLING BAGS. THE ENTIRE TOP FLIPS OPEN FOR EASY ACCESS. NO MORE STRUGGLING TO GET INTO THE END COMPARTMENTS. THE EXTRA 2 INCHES ON TOP IS GREAT FOR BULKY ITEMS. 12" x 29" x 12". LARGE BAG WITH FLAP AND VELCRO...$50.00 THIS IS BY FAR THE BEST DEAL AROUND. 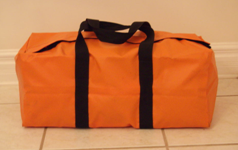 IT HAS ALL THE FEATURES OF THE MEDIUM BAG IS ALMOST TWICE THE SIZE. IT IS REALLY BIG AND SOMETIMES AWKWARD TO CARRY BECAUSE YOU CAN PUT SO MUCH STUFF IN IT. 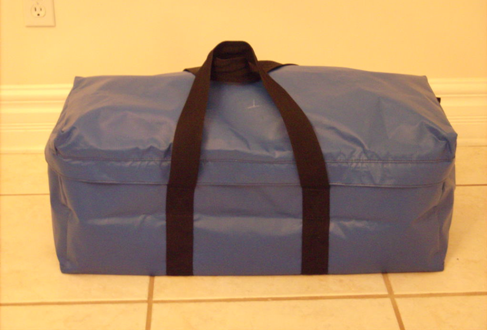 WE OFTEN MAKE THIS BAG FOR SNOW SKIERS WITHOUT THE DIVIDERS. 14" x 36" x 14". LARGE WITH A FLIP TOP............$60.00 THIS IS OUR BEST SELLING BAG AND THE MOST POPULAR ALL AROUND BAG THAT WE HAVE BECAUSE OF ITS SIZE AND DESIGN. IT IS SO EASY TO PACK AND YOU CAN REALLY PUT SO MUCH INTO IT. THE ENTIRE BAG OPENS UP WITH A ZIPPER AROUND THE THREE SIDES. THIS ONE IS WELL WORTH THE MONEY. 14" x 36" x 14".